Mouse anti Cat MHC Class II antibody, clone vpg3 recognizes a monomorphic determinant on feline MHC class II molecules.  MonomorphicThe major histocompatibility complex (MHC) is a cluster of genes that are important in the immune response to infections. In cats, this is referred to as the feline leukocyte antigen (FLA) region. Mouse anti Cat MHC Class II antibody, clone vpg3 recogniszes monomorphic feline MHC class II molecules which are expressed by antigen presenting cells, B cells, monocytes and both activated and resting T lymphocytes. IL-2 dependent feline T cells. Willett, B.J. et al. (1993) Infection with feline immunodeficiency virus is followed by the rapid expansion of a CD8+ lymphocyte subset. Willett, B.J., and Callanan, J.J. (1995) The expression of leucocyte differentiation antigens in the feline immune system., p 3-15. In Feline Immunology and Immunodeficiency (eds.) Willett, B.J. and Jarrett, O.
Beatty, J.A. et al. (1996) A longitudinal study of feline immunodeficiency virus-specific cytotoxic T lymphocytes in experimentally infected cats, using antigen-specific induction. J Virol. 70 (9): 6199-206. Avery, P.R. et al. (2007) Sustained generation of tissue dendritic cells from cats using organ stromal cell cultures. Vet Immunol Immunopathol. 117 (3-4): 222-35. Mumaw, J.L. et al. (2015) Feline mesenchymal stem cells and supernatant inhibit reactive oxygen species production in cultured feline neutrophils. Res Vet Sci. 103: 60-9. Hein, A. et al. (2003) Ramified feline microglia selects for distinct variants of feline immunodeficiency virus during early central nervous system infection. J Neurovirol. 9 (4): 465-76.